You are here: Home / Bargains / Savings Guarantee at Coupons.com – How do you know if you are saving money? Savings Guarantee at Coupons.com – How do you know if you are saving money? This post is sponsored by Coupons.com and uniquely written for Enza’s Bargains readers. How do you know if you are shopping online and have actually saved the most money? I almost always do my research before purchasing a product online to be sure that I am saving the most money. Sometimes I get so excited and I use the first coupon code that I find. What if I tell you that there is a way to insure that you are saving the most possible money? It is more of a we-stand-behind-our-savings deal! Coupons.com have what they call a Savings Guarantee! No longer do you have to stress with savings remorse! You know when you buy something and then 20 minutes later you find a BETTER deal! If you FIND a better coupon code on another website that isn’t listed on Coupons.com they will now PAY YOU MONEY! Here is how the Savings Guarantee works: If you find a coupon code that coupons.com doesn’t have then they will pay you $25! Also during the month of July, that bonus goes up to $50! They want shoppers to shop with confidence and use their website! Check out Coupons.com Savings Guarantee today! – Codes that are exclusive to another website. – Codes that provides the same discount as one that is already listed. – Personal referral codes or a one-time use code. – Non-code offers such as grocery coupons, in-store coupons, or discounts embedded in a link. 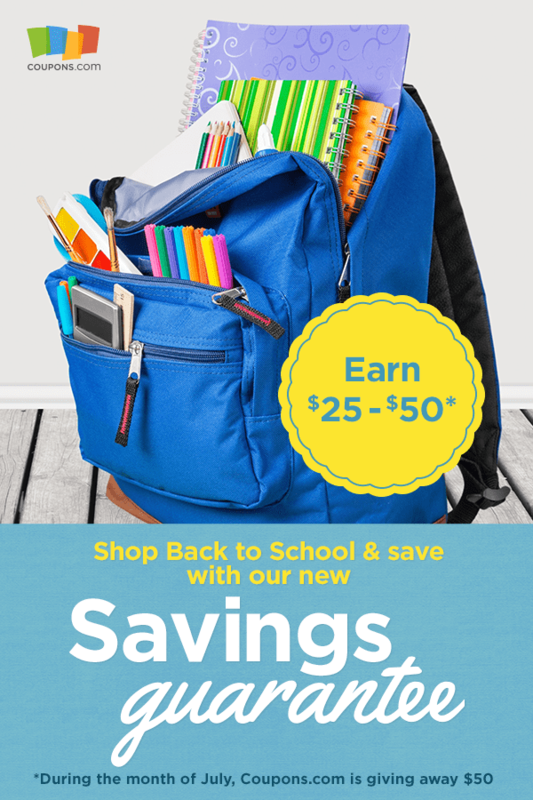 Start your Back 2 School shopping early and be ready to save! This is the best way to know whether or not you are saving the most money. Just know that Coupons.com will PAY people if they find something NOT listed! That is a company who I believe stands behind what they believe in when it comes to savings! Thank you! This is very helpful. I will definitely check this website out. This is really interesting! I am familiar with eBates, and I recently heard of the “Honey” sidebar app for Google Chrome, I haven’t used Coupons.com before, but it sounds great.